In November of last year, EPA proposed to scale back the overall Renewable Fuel Standard (RFS) 2014 blending target from 18.15 billion to 15.21 billion gallons, and to trim the mandate’s corn-ethanol component from 14.4 billion to 13.0 billion gallons. Forcing EPA’s hand was a set of market constraints commonly called the “E10 blend wall.” EPA intervened so that refiners would not be obligated to purchase and blend more ethanol than could actually be sold in gasoline. The biofuel industry fiercely opposes the proposed cutbacks. EPA is expected to announce the final 2014 RFS production quota in June. EPA can’t dispute this conclusion because the numbers come from the agency’s own data. 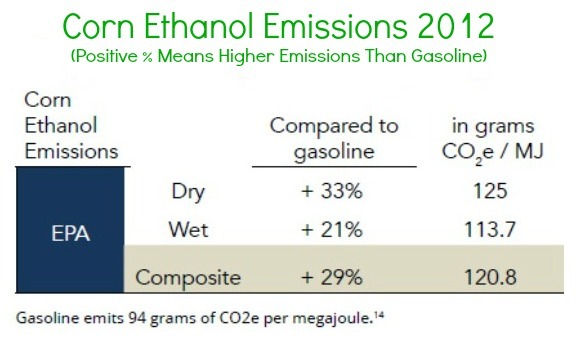 EPA estimates that, on a life-cycle basis, corn ethanol’s carbon dioxide-equivalent (CO2e) emissions were 33% higher than gasoline’s in 2012. 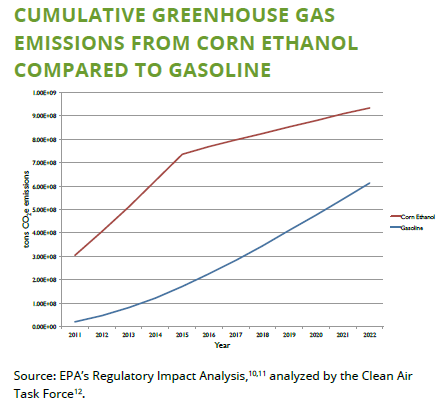 Since a chief purpose of the RFS is to reduce greenhouse gas emissions, the policy is counterproductive if corn-ethanol emits more CO2e than the gasoline it displaces. 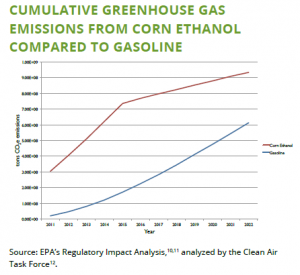 EPA, however, predicts that by 2022, biofuel production will reduce net CO2e emissions by 17%. EWG estimates that during 2008-2012 alone, RFS-induced land conversions released 85-to-236 million metric tons of CO2e emissions per year. Emissions from wetlands conversions between 2008 and 2012 totaled 25-to-74 million tons of CO2e per year. The additional 8 million acres of grasslands and shrub lands converted to corn from 2008 to 2011 added another 60-to-162 million tons of CO2e per year. In all, land conversions to corn production released 85-to-236 million tons of CO2e per year.